Before I begin Today's Tutorial, I assume that you already have a PayPal account linked with your Bank account and having some balance to withdraw. If you don't have a PayPal account then you can check my Tutorial on How to Set Up a PayPal account and also read the PayPal Frequently Asked Questions, So that you are aware of some common problems which might occur. Step 3: Click on Withdraw Funds to Back Account. Step 4: Enter the Amount you want to withdraw, Choose the back account from the dropdown. Once you are done with it, Next you have to wait for few days (5 to 7 days) for the money to get transferred to your bank account. Sometimes the money will be transferred soon. 1) What Purpose code should I choose if in India? Purpose code depends upon your use and purpose for using PayPal. The full list of purpose codes is available on website of Reserve Bank of India. 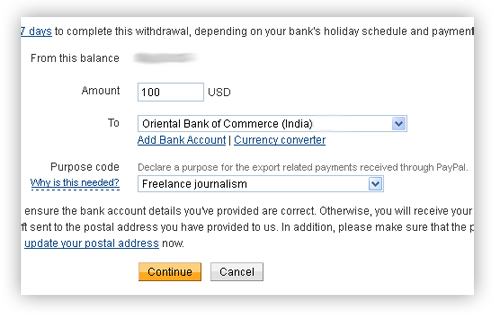 If you are a Blogger then you can choose freelance journalism as purpose code. 2) What is the minimum Withdrawal amount? 3) How much time does PayPal funds take to arrive in your Bank? Once the processing completes, It takes about 5-7 days for the funds to get transferred in your bank account. PayPal sends an email mentioning the expected date. I live in Mumbai, India and it takes only 3-4 days for funds to get transferred in my bank account. It may take long for people who live in small towns. 4) What will happen if my Bank rejects the PayPal transfer? 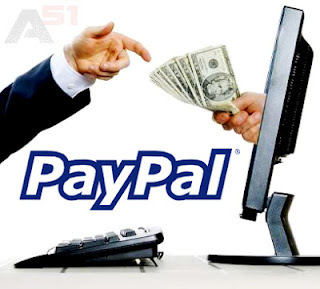 If somehow your PayPal transfer request is rejected by your Bank then, PayPal deducts $5 USD (Rs. 250) as processing fee and the amount is returned to your PayPal account. So this was the Tutorial on How to withdraw money from PayPal to Bank Account. I hope this guide was helpful and If you are having any problems then you can leave a comment below and I'll try to reply as soon as possible.